What do you take for a cold? Matzo ball soup, of course! Cold and flu season is upon us, and the fatigue, congestion, and dehydration that come with a cold can be especially difficult – and risky – for seniors. Compromised immune systems and weakened reflexes common in many elderly people means that a cold can become more serious. For a senior living with a cold, it’s important to be on the mend as quickly as possible. While there is no cure for the common cold, research over the past fifteen years has shown that chicken soup does actually help with symptoms. The heat of the soup, the carbohydrates in the matzo balls, the extra liquid for hydration, and the chemical properties of the broth all combine to help the body power through a cold. And, in addition to the medicinal benefits, matzo ball soup provides a comforting taste of home. In a popularly cited study, Dr. Stephen Rennard of the University of Nebraska Medical Center in Omaha conducted laboratory tests to determine why chicken soup might help with colds. He found that in volunteers who ate chicken soup (his wife’s family recipe), the soup inhibited the movement of certain infection fighting white blood cells. This is actually positive: Rennard theorizes that less movement of these cells means fewer upper respiratory symptoms. That’s good news for seniors – or anyone – struggling with congestion and headaches while a cold runs its course. Add to that the benefits of vitamins A, C, and D in the broth, the anti-inflammatory properties of the soup vegetables, and a boost of energy from the carbohydrates in the matzo balls, and you’ve got a recipe for feeling better! For every matzo ball, there is an opinion about what makes it great: light and fluffy or dense and chewy? Should it float or sink? Here are some tips for getting your matzo balls just right. Light, fluffy matzo balls that float: add about 1 tbsp. seltzer to matzo ball mix for each ¼ cup of matzo meal. Really light, fluffy matzo balls: add seltzer plus up to a 1/4 tsp. baking powder per 1/4 cup of matzo meal. The more baking powder you use, the more light and fluffy the matzo balls will be. Flavorful matzo balls: Modern recipes call for oil, but many matzo ball mavens agree that schmaltz makes it better. 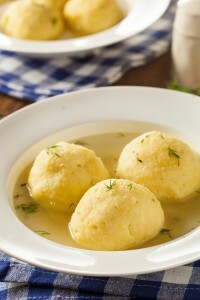 Really flavorful matzo balls: Cook the matzo balls in broth, then transfer to a fresh bowl of soup. FountainView at College Road is a glatt kosher senior living community that has matzo ball soup on the menu in Rockland County, NY.